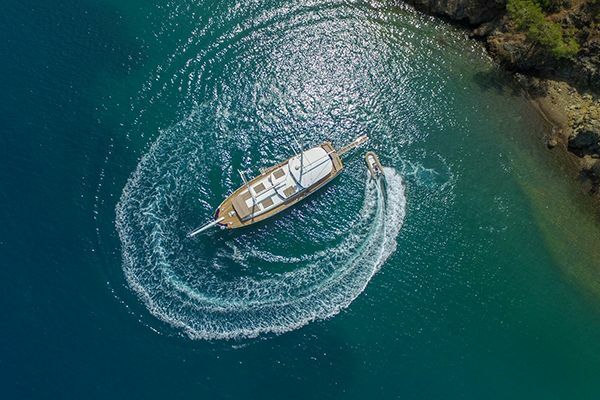 One of the main stopping points for the gulets that cruise along bays between Marmaris and Gocek is Ekincik Cove. First you will see through the beautiful village of Ekincik, surrounded by gree. And than you get into the cove itself, which is extremely clean and has not been suffocated by heavy building. You are surrounded by forests while in front of you there is the beach and the sea. The beach is very beautiful and the water very clean. On its western part, among the popular stopping or overnighting coves there are Semizce, Kargi and Karacay. There are two anchoring points in the port of Ekincik. One of them is Köy Önü (In front of the village) In the area where the road meets the beach there is a quay where yachts can moor. The cute little holiday destination known as Dalyan is located on the shores of the fjord like natural channel, called Calbis in ancient times, which links Lake Köycegiz to the sea. With the start of tourism development in recent years and threat of the danger to the environment led to the area being declared by the state as a special protection district in 1998. This measure helped to protect the region from over development. The village of Dalyan, without a change in its natural beauty for many years, is today still very far from the threat of excessive development. Boats are all lined up along the channel in Dalyan. These channel are no more than places to cruise around and see as far as they are concerned. The boats are used as a private or shared boats for rent to enable tourista to the see the Iztuzu coast, the ancient city of Kaunos, the rock tombs and the sites of mud baths. From the wharf near the ruins reachable from Dalyan by boat it is just a 10 minutes walk to the ruins of the ancient city of Kaunos. 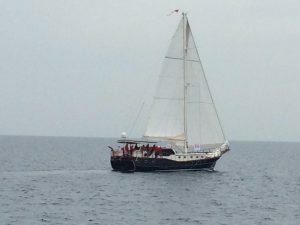 Those coming by yachts can drop anchor around Delikli Ada and go ashore by small boat. Kaunos was a significant trading port, through it lost its strategic importance as the alluvial sands filled the harbour. According to the father of history, Heredots, the people of Kaunos were natives of Caria who considered themselves to be Cretans. The rock tombs that can be seen from as far as Dalyan were built in 4 BC and were also used during the Roman period later. In Lycian type tombs the dead were placed on rock beds. The coast of Iztuzu became World famous thanks to the Caretta Caretta turtles. On one side of the coast are the Iztuzu beach facilities and on the other side are the Dalyanagzi day-outing beach facilities. This beautiful coast goes on four kilometres on end. There are suitable places high enough to take photographs as one gets closer to the beach. This panorama includes all of the delta and the coast. Iztuzu, quite apart from the Caretta Caretta turtles, is simply a wonderful gift of nature. And they come to the beach on here coast to lay their eggs. Their lenght is about 1-1.5 metres and they weigh as much as 150 kg. There is magnificent scenery of in a type seen in labyrinths, with the 5.4 kilometre along coast going round and round the marshes. On the coast around Dalyan during all seasons the turtles ranging up to one metre in lenght can be seen. 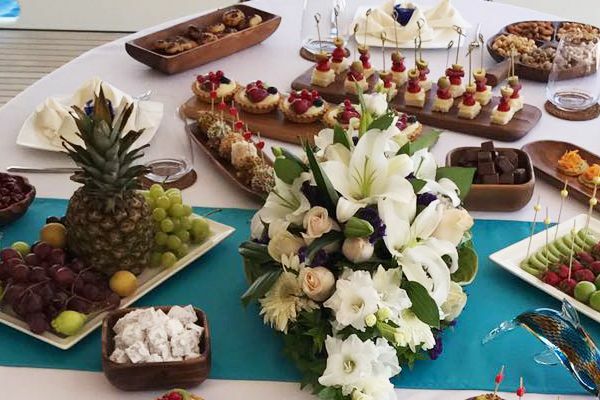 Sarigerme, with its close proximity to Dalaman and with more modern accommodation facilities being built, has found itself as a centre of tourism in a region fast becoming internationally popular. The interaction of pine trees and the coast of Sarigerme, with its fine sand againist the backdrop of beautiful pine trees, has continued for centuries. Visiting gulets anchor in the rocky small cove on the North east of Baba Island. The sea is clean and shiny. A cave close to the northern end of the island crosses the island from one side to the other. On the top of the hill there is the ruin of a tower. The flat Dalaman Plateau begins to increase in height as you get to the Kapidag Peninsula, reaching an altitude of 500 meters before Kurtoglu Point. After this area, the Gulf of Fethiye calm waters begin. The 13,5 kilometres opening between Kurtoglu and ?blis (Dökükba??) is the mouth of the gulf. 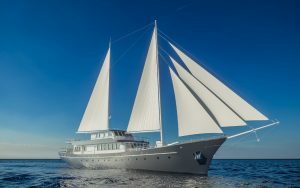 This gulf has the most popular coves and islands for the Blue Cruise gulets. 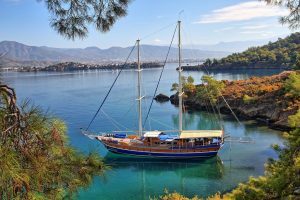 The Gocek region in Fethiye Gulf has numerous beautiful coves and islands and is extremely popular among the yachts or gullets on the Blue Cruise. 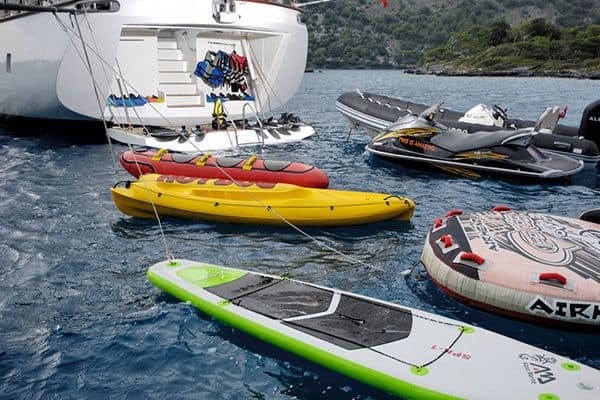 In Gocek there are four marinas where all services are available for yachts. 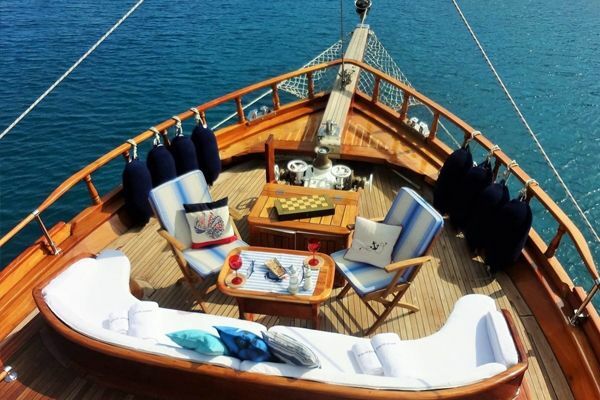 The Göcek coves and islands are the meeting place of Turkey’s and the world’s “high society”. 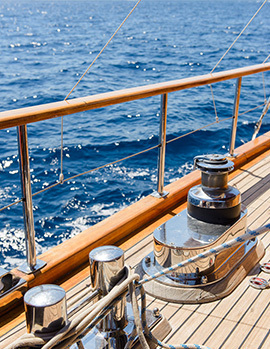 Boats that compete in luxury with each other sail through out the region. Göcek is a calm and quite village where tall buildings has not been granted. 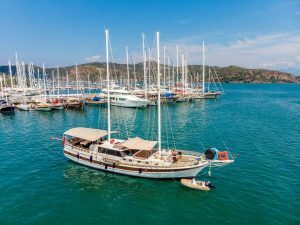 The tourism activity of Gocek can said to be almost fully focused around the marina, with all the restaurants and shops being around the quay. The walking trail on the seaside that existed until recently has been removed after becoming shabby. By setting up new paths with a design in harmony with the environment, both locals and foreigners can be at peace with the sea. It is believed that it has taken its name from the wild boars living on that island once upon a time. The island is also called Prince Island referring to a prince living on here. The island is covered with pine and olive trees. There is a shallow area of 30 to 40 metres in diameter in the middle of the cove where there are ruins from the Lycian and Roman ages. The highest of the ruins are a meter below the surfaceof the water. It is very pleasant to swim over the ruins, especially when wearing the googles. 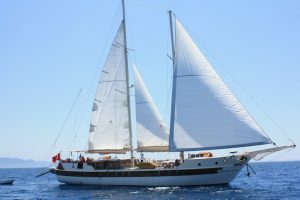 Gulets can easily anchor and moor in the cove of the island as it is sheltered from the winds. This group of islands are so small that no one could came up with names for each of them. They are together known as Yassicalar. There are no facilites on the islands. On the largest island of the group the beach is near the point and forms a small pool, excellent for children. One is able to swim between the different islets, the closest being just 12 metres distance. If you can swim for half an hour, you can visit four different islands and, if you have shoes with you, you can walk over on each of them. 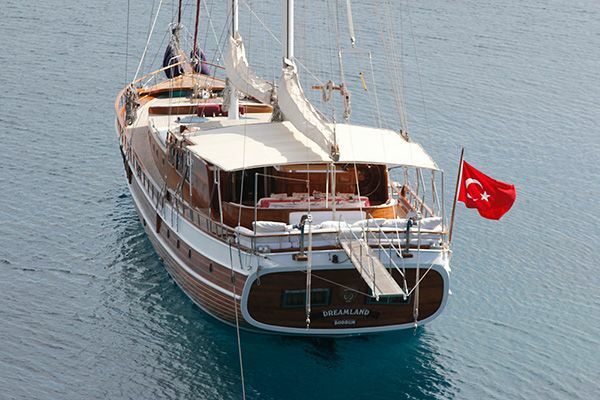 When you get towards the Gocek Gulf, the most popular destinations are AGA PORT and KOCABUK. The Aga Port consists of one small and one large harbour. Both end in a beach area. Those who follow the path upwards from Buyuk (Large) Aga port can get to Roman and Byzantine ruins in the Koyici region. Another leads you up the hill to the west and to the point of the Kapidag Peninsula that has a lake on the park. There are three or five houses around the lake, and a terrific view from above. After Aga Port you get to Kocabuk, Gobun Island and then to the Gulf of Gocek. The coves and the islands in the gulf have been declared a Special Environment Protected Region since 1988.